Relive the exciting conclusion to the 2016-2017 PBA Philippine Cup eliminations as GlobalPort, Ginebra, Star, and Alaska notched big wins. The Rain or Shine Elasto Painters couldn’t help but be disappointed with the way they defended GlobalPort Batang Pier’s dynamic duo of Terrence Romeo and Stanley Pringle who combined for 72 points in their 117-99 win on Sunday. Romeo exploded for 44 points while Pringle erupted for 28 markers as they obliterated every defender Rain or Shine sent to them. Riding a wave of confidence from its late second quarter spurt, Ginebra trumped NLEX, 90-80, to secure a seat in the 2017 PBA Philippine Cup quarterfinals Sunday at Cuneta Astrodome. LA Tenorio was stellar, firing 30 points, 15 coming in the second half, that went with nine rebounds, and four assists as the Gin Kings finished their eliminations schedule with a 6-5 card. The streaking Star Hotshots closed the Oppo PBA Philippine Cup elimination round with a fourth straight victory, blowing out the Mahindra Floodbuster, 124-87, to remain firmly in the race for the No. 2 seed on Wednesday at the Cuneta Astrodome. Star moved up to 7-4 but needs Alaska to lose in the second game of the double-header to claim second place and the twice-to-beat advantage in the quarterfinal round. Allein Maliksi scored 33 points, including a terrific 7-for-8 clip from three-point range, to lead Star in another big win. Maliksi averaged 25.5 points in their previous two games, including a 47-point blowout of Meralco. The Alaska Aces were able to overcome both the foul trouble to star player Calvin Abueva and a fourth quarter Rain or Shine lead as they stormed back to beat the Elasto Painters, 94-89, and clinched the No. 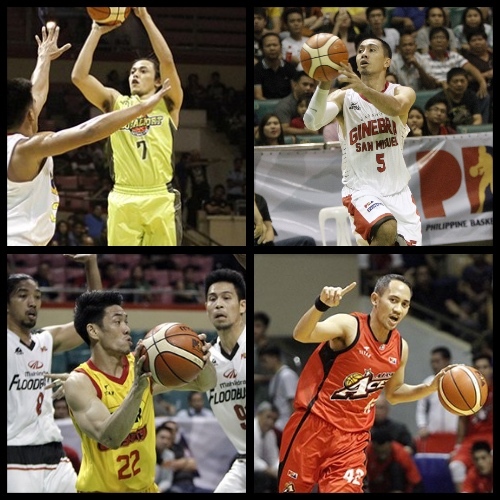 2 seed in the Oppo PBA Philippine Cup on Wednesday at the Cuneta Astrodome. Alaska tied Star at 7-4 but will take second place due to their winning the head-to-head between the two teams, 97-90, last January 11. JVee Casio led Alaska with 25 points on 8-for-12 shooting and 5-for-6 from beyond the arc.